I know, I know. I've raved about 'clean' banana icecream time and time again, but this one is UNREAL. So creamy, milky and genuinely 100% tastes like icecream. The secret?! Unflavoured whey. Organic unflavoured whey, to be precise, from the Good Stuff Organic (more on them later). This tastes so nice even James, who has been 'polite' about healthy desserts I've made in the past, has said that this is the best one yet. Chuck everything into your blender, and whiz until you're left with a smooth, thick, creamy, but slightly frozen, consistency. Spoon into bowls, top with white chocolate sprinkles and dig in. If you make it, you'll know what I mean when I say it's really creamy. The whey gives it a proper 'icecream' taste; milky and thick. The cacao nibs add a rich crunch and the white chocolate is the icing on the cake, really. 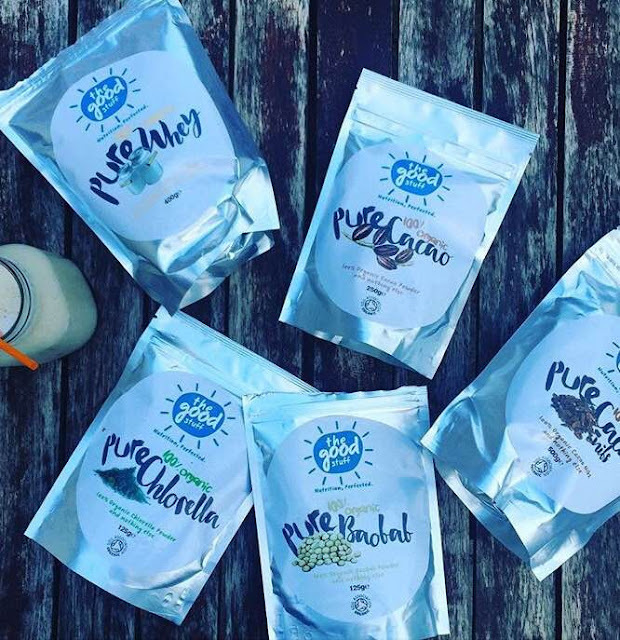 Give it a go with unflavoured whey, and let me know what you think! Also, I mentioned The Good Stuff Organic at the start of this post - they're a new start up company based in Alderley Edge, Cheshire and they kindly sent me a selection of products to try out. It's run by two people, Tom and Alex. I've only spoken to Alex, but she's lovely. It's so nice to work with people who are passionate about what they're doing day in and day out. They pride themselves on no added nasty crap in their products, 100% natural, with no artificial flavourings. They bill themselves as "the supplement for the athlete that cares about their health as much as their muscles," and since having a snoop on their site and learning more about them, I love what they're about. I'd highly recommend giving them a follow on Insta or Twitter. I'm looking forward to trying the baobab as I've never used this before, so holler with any recipes you think I should try. Oh, and any more protein nicecream ideas, please send them my way!